Máire Geoghegan-Quinn, EU Commissioner for Research Innovation and Science, visited ArcLabs in Waterford on Monday 08th Oct 2012. She was speaking at an event in Waterford Institute of Technology (WIT), and then met with spinout companies from WIT, including FeedHenry. 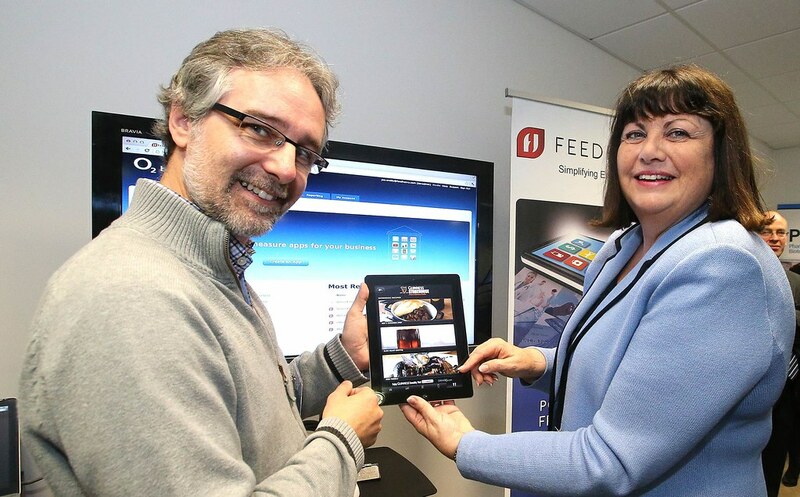 The photo shows me with the commissioner demonstrating the Guinness Storehouse app. FeedHenry’s key strategic partnership in Europe is with Telefonica (O2 UK and O2 Ireland), and our key strategic partnership in the US is with VMware. Telefonica offer a white label version of our platform to their enterpise customers. VMware have used our platform to build apps distributed internally via their own enterpise app store, and externally via public app stores. In addition Feedhenry have a special version of their platform, MobileCF.FeedHenry.com, that targets Public Cloud Foundry.